There are some bands that no matter how long ago you were into their stuff, every time you go rummaging through your Cd's and come back to them you still like them just as much as the day you first discovered them. Nomeansno is one of those bands to me. I discovered them about 16 years ago when I was just starting junior college. They really appealed to me. They had the energy of punk, but were extremely art and prog rock driven at the same time. Loud, rumbling complex bass lines, booming vocals, fast tempos, bizarrely tuned guitar playing, and on the spot deep yet humorous lyrics about alienation and other things really appealed to me at the time. They were kind of like the punk band X on steroids with a little dash of Voivod like prog metal thrown in. The first album I bought by them was "Wrong" and shortly after I picked up "0+2=1". 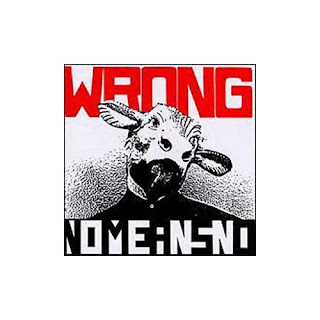 "Wrong" was by far their strangest effort but some of the songs quickly wore thin. "0+2=1" on the other hand was a completely different story. It blew me away. The songwriting was much better, and the songs flow into each other seamlessly. There is not a weak track on this album, and every track oozes with anger and emotion. Over the years I have bought some of their other albums but they didn't appeal to me as much as these two. Get "0+2=1" first and if you like it, pick up "Wrong". Here's a couple of tracks, the first one is "The Tower", from the "Wrong" album, and the second is "Joyful Reunion" from "0+2=1". Enjoy!